Should you use 2,4-D to emerged wheat in the fall to control weeds? The short answer is no. First, the label clearly states under the “Application Timing” section: “Do not apply to seedling winter cereals in the fall.” Second, there are other labelled and less injurious herbicide options that provide equivalent or better control of the weeds that could be targeted in the fall (Table 1). If you are interested in an explanation of why the “Do not apply” statement exists on 2,4-D product labels, then read on. What is the evidence to support the labelled statement? There are eight different studies evaluating 2,4-D applied to winter wheat in the fall. Half of the trials demonstrate no increase in crop injury or reduction in grain yield from applying 2,4-D in the fall (Swan and Rohde, 1962; Fowler et al., 1986; Derksen et al., 1989; Blackshaw, 1990). Of the remaining studies, all have demonstrated increased crop injury and grain yield reductions that range between 14 and 24% (Klingman, 1953; Robison and Fenster, 1973; Ivany et al., 1990; McNaughton et al., 2014). 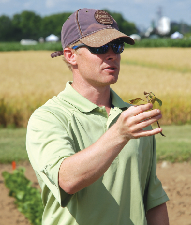 The most recent study demonstrating such yield losses was conducted in Ontario by Dr. Peter Sikkema. A summary of grain yield influence by fall herbicide treatment is shown in figure 1. What does the injury look like? A 1953 study by Klingman observed that “Fall spraying resulted in many morphological abnormalities such as fused edges of sheaths or twisted sheaths which caused difficulty of the spikes emerging from the sheath”. Figure 2 demonstrates the type of injury that can occur when 2,4-D is applied in the fall. Figure 2. Winter wheat head distortion as a result of fall applied 2,4-D. Source: Dr. P.H. Sikkema, University of Guelph (Ridgetown Campus). Why is the risk of injury greater with fall applications? Tottman, 1977, noted that when growth regulating herbicides like 2,4-D are applied prior to the “double ridge” stage (i.e. roughly Zadok’s 30) they are more likely to “produce leaf and ear deformities by interfering with the arrangment of new leaf and spikelet primordia at the stem apices and sometimes reduce yields”. Simply put, when you apply 2,4-D in the fall it will almost certainly be prior to the double ridge or Zadok’s 30 stage and therefore when the crop is more susceptible to head deformities. Application timing is just as critical for spring application in order to minimize the potential for injury. The label states that 2,4-D applications can be made from full tillering until early flag leaf. Applications made before or after this stage have the potential to cause injury that results in reduced grain yield. Does 2,4-D control weeds that labeled fall applied herbicides cannot? No, Table 1 (click here to download) summarizes weed control ratings for winter wheat herbicides. Any weed species typically found in winter wheat during the fall in Ontario can be controlled by one of the registered fall applied herbicides just as well or better than 2,4-D. But 2,4-D is cheaper you may say. Is it? It would be easy to make the argument that the use of 2,4-D in the fall is a net loss if we assume that your winter wheat fields will mirror the scientific research in that 50% of the time the crop will be affected with a 10% yield reduction (being conservative). Below is a scenario for a farm growing 500 acres of winter wheat and using 2,4-D to control weeds in emerged winter wheat during the fall, compared to the use of a safer but more expensive herbicide. Blackshaw, R.E. 1990. CONTROL OF STINKWEED (Thlaspi arvense) AND FLIXWEED (Descurainia sophia) IN WINTER WHEAT (Triticum aestivum). Canadian Journal of Plant Science. 70(3):817-824. Derksen, D.A., Kirkland, K.J., McLennan, B.R., Hunter, J.H., Loeppky, H.A. and K.E. Bowren. 1989. Inlfuence of fall and spring herbicide application on winter wheat. Canadian Journal of Plant Science. 69(3): 881-888. Fowler, D.B., Graham, M.L. and R. Ashford. 1986. Influence of fall applied 2,4-D amine and MCPA on cold hardiness and other agronomic characters of winter wheat and rye. Canadian Journal of Plant Science. 66:837-843. Ivany, J.A., Nass, H.G. and J.B. Sanderson. 1990. Effect of time of application of herbicides on yield of three winter wheat cultivars. Canadian Journal of Plant Science. 70(3):605-609. Klingman, D.L. 1953. 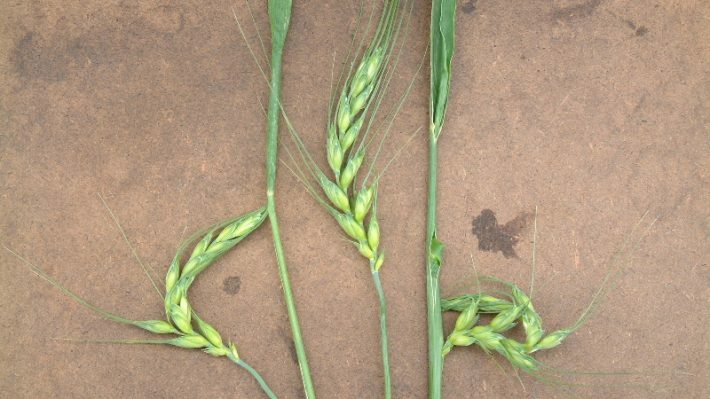 Effects of varying rates of 2,4-D and 2,4,5-T at different stages of growth on winter wheat. Agronomy Journal. 45 (12): 606-610. McNaughton, K.E., Brown, L.R. and P.H. Sikkema. 2014. 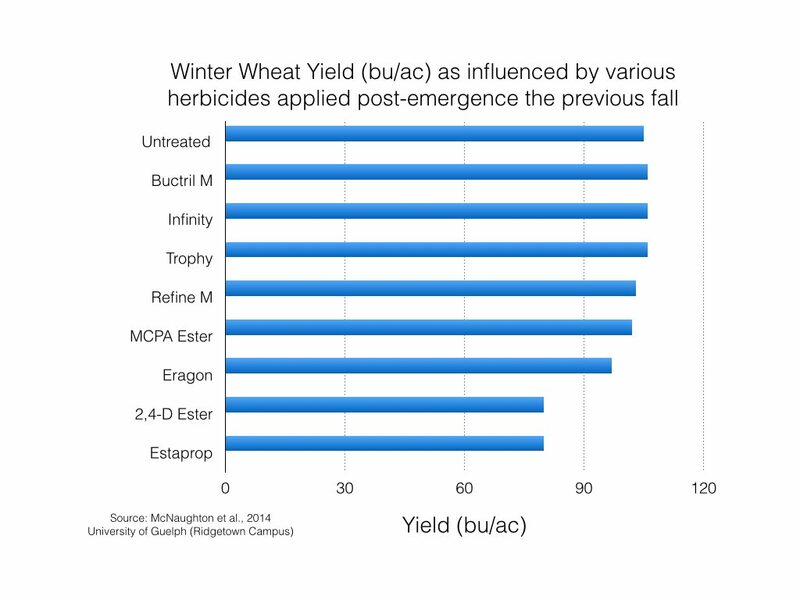 Tolerance of winter wheat and under seeded red clover to fall applied post-emergent broadleaf herbicides. American Journal of Plant Sciences. 5:1265-1271. Robison, L.R. and C.R. Fenster. 1973. Winter wheat response to herbicides applied postemergence. Agronomy Journal. 65: 749-751. Swan, D.G. and C.R. Rohde. 1962. 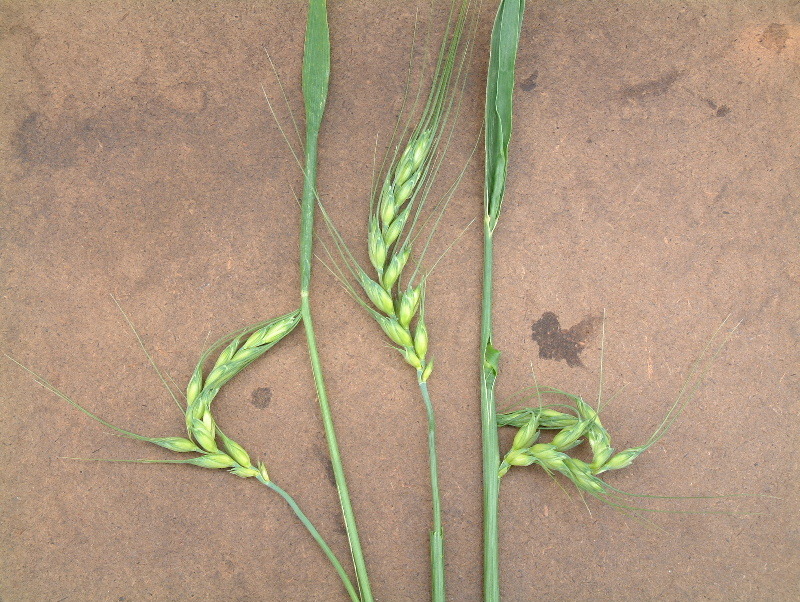 Effect of 2,4-D on three winter wheat varieties grown in Oregon. Crop Science. 2(2): 179-180. Tottman, D.R. 1977. The identification of growth stages in winter wheat with reference to the application of growth-regulator herbicides. Annals of Applied Biology. 87:213-224.